There are a few things I have discovered about this whole vegan diet. Allow me to share with you. Clear skin. Did you know dairy in the main culprit for acne? Yeah, neither did I. For the week I was vegan, my skin cleared up completely. The next week I caved and ate some meat and dairy and my skin immediately broke out like crazy. Peanut Butter and Jelly is vegan and so are Oreos! Weight loss. Not that I'm trying to or need to but it was a nice little surprise. Digestive issues clear right up and everything is regular. I know, this may be TMI but it's the absolute truth. A Pumpkin Spice Latte from Starbucks with soy milk makes my tummy much happier than a Pumpkin Spice Latte made with real milk. You can eat raw cookie dough! Not to mention, baking vegan is so easy and just seems to be less messy. You don't have to worry about bad eggs and contaminating your kitchen. My energy level was through the roof. I felt great and well rested. I woke up refreshed. The week I went back on the meat I was sluggish and sleepy. The "milk" doesn't spoil in a month. Soy, Rice and Almond milk all last for about 6 months. No worries about growth hormones or bovine health and I didn't have to worry about taking meat out of the freezer to thaw for dinner. Lower grocery bill. Meat is pretty expensive. Raw veggies are much more appetizing to handle than raw meat. Preheat the oven to 350 degrees. Line your muffin tins or lightly grease them. In a large bowl, beat the sugar and oil together, then add the mashed bananas. Stir in the water and vanilla and mix thoroughly. Add the flour mixture, along with the chocolate chips, and stir to mix. Fill each muffin tin halfway with the batter. Bake for 20 - 30 minutes, until they are golden brown and a toothpick inserted into the center comes out clean. My friend Jenn and I took the girls to the Missouri Botanical Gardens on Friday. Oh that garden is magnificent. What a wonderful day you had. Just to be argumentative, but I thought carbs were the main cause of acne?! No really, I did. Where did you learn this? I also thought that processed foods that were stripped of their real nutrients were the cause of constipation/irregular bowel habits, and that if you ate unprocessed food, without additives or artificial colorings, preservatives, and lab-made sugars, that these problems would clear up. When you changed to a vegan diet, did these things I just mentioned also drastically get reduced in your diet (obvi you are eating oreos, so not all of it is gone)? Just wondering if the overlap could also have helped?!? Interesting experience and I can't wait to hear more! ahhh i totally agree with you on the pros of being vegan!! clear skin, especially :). 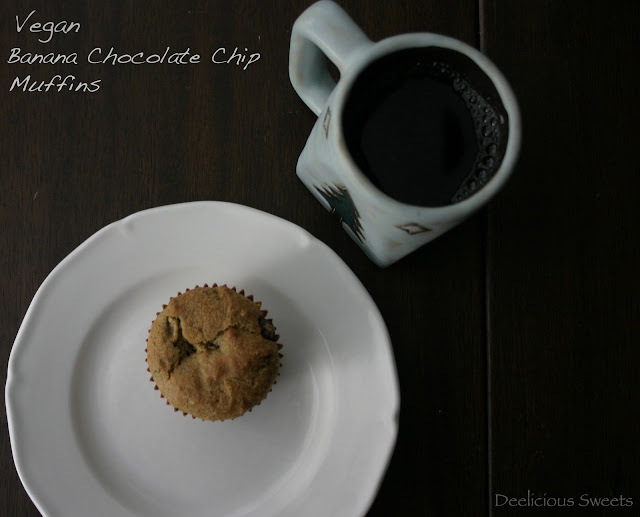 love the banana chocolate chip muffins! delicious~ i would love to try making this GF as well! :) have a great day Dee! Love all the beautiful pictures today and reading all the great pluses to eating a Vegan diet. I love soy pumpkin spice lattes too! Dee these look so good. I've heard lots of people say they have such improvement in their health when going vegan. So are you going to become vegan for good? These muffins look good enough to tempt me! Wow...great benefits to going vegan! No wonder you look so good! The muffins look yummy! My favorite kind of muffin (blueberry is a close second!). And great pics at the botanical gardens...looks like you had a great day!